Brief Description of Subject: The window is located behind the Bishop's stall in the south side of the ambulatory. It was donated in memory of Peter Edward DeMill, for many years the treasurer of the Diocese of Michigan. St. Ambrose of Milan (340-396) is a Doctor of the Church. There is a legend that shortly after birth a swarm of bees went into and out of his mouth with honey. He became the Bishop of Milan, was a staunch defender of the Trinity against the Arian Heresy, and was an important composer of plainchant. When St. Augustine, then a pagan, came to live in Milan, he came under the influence of Bishop Ambrose and converted to Christianity. Long after St. Ambrose's death, it is said that when Milan was under attack by Emperor Louis of Bavaria in 1338, St. Ambrose appeared on horseback with a three-corded whip and so panicked their forces that they fled in terror. The upper scene of the window depicts St. Ambrose costumed as a bishop, and carrying a crosier and a three-corded whip. At his feet is a beehive and in his left hand is a book inscribed with the first two verses and accompanying music of the plainchant "Te Deum" -- a hymn believed to have been composed by St. Ambrose. 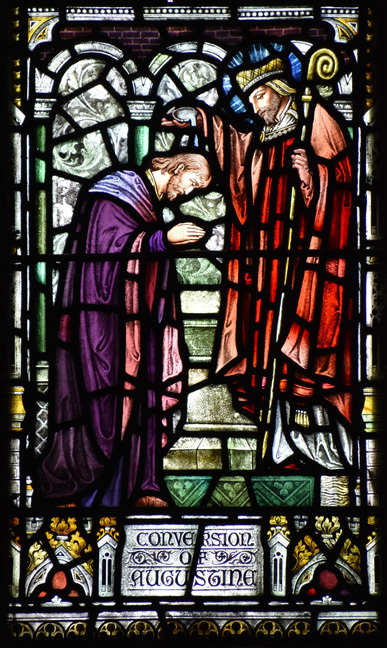 The lower scene depicts the baptism of St. Augustine by St. Ambrose in 387. The inscription reads "CONVERSION OF AUGUSTINE"